The Faculty of Medicine received a total of $31.2 million for eight projects in the latest round of Canada Foundation for Innovation (CFI) funding, announced today at the Djavad Mowafaghian Centre for Brain Health (DMCBH). These projects represent the majority of the 15 grants, totaling $52.2 million, awarded to UBC. Two of these were awarded to ICORD members. 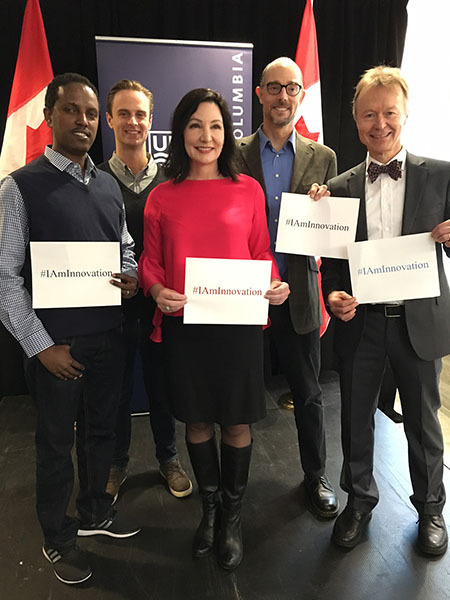 Cripton lab trainees Abebe Zelalem and Tom Whyte with Cheryl Wellington, Peter Cripton, and Wolfram Tetzlaff at the CFI announcement October 13, 2017. ICORD researcher Dr. Cheryl Wellington received $4.5 million for further development of a platform for investigating traumatic brain injury (TBI). The project stems from a technology invented at UBC called Closed Head Impact Model of Engineered Rotational Acceleration, which reliably produces diffuse axonal injury, the major pathology in human TBI. Drs. Wellington and Peter Cripton, another researcher at ICORD, are collaborating on a project to identify biomarkers for TBI and more accurately predict recovery and long-term consequences. ICORD Director Dr. Wolfram Tezlaff along with colleagues Drs. Peter Cripton, Brian MacVicar, Piotr Kozlowski, John Kramer, Andrei Krassioukov, Brian Kwon, Tom Oxland, and Chris West, received $1.6 million to refine techniques for modelling and analyzing spinal cord injury. The project will develop the next generation of equipment to study fracture-dislocation injuries in experimental models, thus providing more clinically-relevant examples of the stresses on the spinal cord and the resulting tissue damage — essential information for the development of treatments and design of clinical trials to test treatments in humans. The researchers will use such models to search for biomarkers in cerebrospinal fluid, to conduct optical sectioning and three-dimintion modelling to better examine healthy and damaged tissue, and to evaluate motor, cardiovascular, urological, and sensory outcome parameters in animals. The Innovation Fund supports initiatives that allow universities, colleges and research hospitals and their students to build on existing areas of expertise such as artificial intelligence, quantum science, brain health, and renewable energy. This fund aims to put the right tools in the hands of the country’s scientists so they can discover, innovate and train their students for the jobs of tomorrow. By doing so, scientists are contributing to building a bolder, brighter future for all Canadians, one that includes a strong and healthy middle class.